Meanwhile, back in Vermont ... after leaving Marshfield and the Martin Bridge behind I continued west on Route 2 until I found myself arriving in Vermont's Capital City - Montpelier. I had to admit that I was rather surprised at how small of a Capital City it is but that really made it that much more quaint; come to find out it's the smallest Capital City in the United States with a population of under 9,000! It was easy to spot the State House as I drove into town so I decided a quick stop to take some pictures was in order - much to the dismay of my GPS which was trying mightily to get me to Stowe! Oh, recalculate and deal with it, woman! Keeping my eye on the golden dome, it was easy to get to the State House and even easier to find a place to park as the street in front seemed totally abandoned. Was it a Vermont holiday or something?!? Not that that was a problem, mind you, as it gave me the chance to take a picture with absolutely no distractions in it like pesky cars or people (well, if you look closely there are three people walking in front of the steps of the building but they're pretty hard to spot!). The current State House, nicknamed "The People's House", is the third capital building to have stood in this very spot and was completed in 1859. 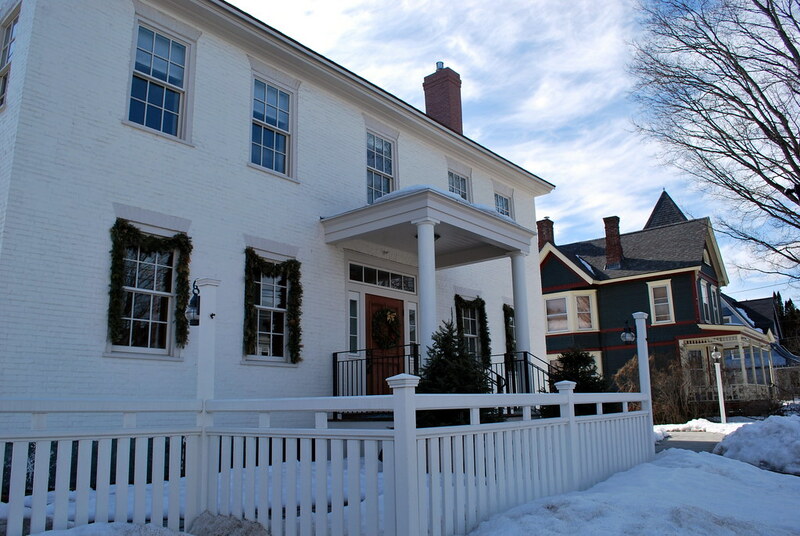 The building is designed in the Neoclassical style with Greek Revival detail and was completely and carefully restored in the early 1980's. The State House's dome, copper on a wood substructure which was not gilded until the early 20th century, is topped by a statue titled "Agriculture" though she's more commonly referred to as Ceres, the Roman goddess of agriculture. The statue was carved in 1938 by Vermont's Sergeant-at-Arms, 87-year old Dwight Dwinell. 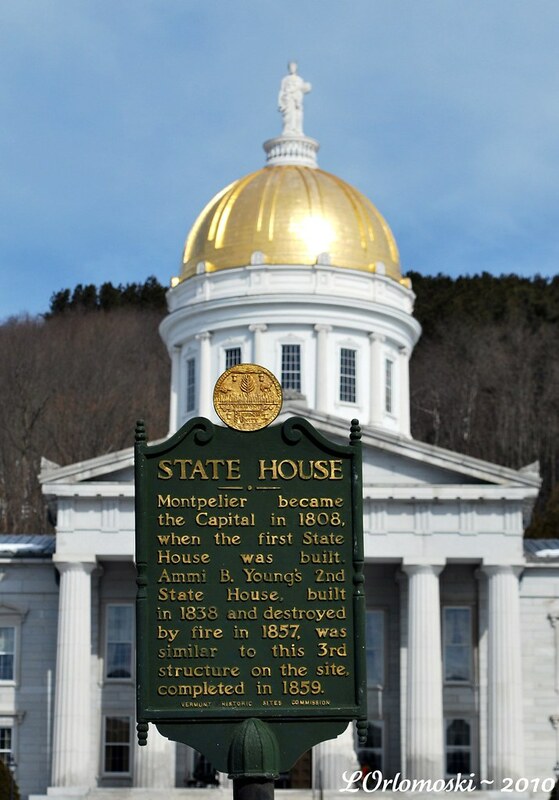 Next time I'm in Vermont I wouldn't mind popping in for a tour of the interior of the State House but alas, this time I was on a mission and I was bound and determined to make it over to Stowe in a timely manner. There were covered bridges waiting somewhere in the woods for me while the sun was shining brightly so I merely took a couple shots of the outside edifice, got back in the car, and made my GPS unit happy by heading back in the right direction! but alas, there were no covered bridges that I could see. Fortunately, there was also a good-sized tourist information center so I popped in and asked the clerk where I might be able to find Emily's Bridge. She whipped out a local attraction map and circled the location of the bridge (nowhere near Route 100 I might add!) as well as the location of the other two bridges in the area. After I thanked her profusely for her help, she sent me off with the warnings of "Emily's Bridge is reported to be haunted" and "Watch out for the muddy spots!" I wasn't really worried about the first but the latter had me a little concerned, especially when I found my route of travel to be on some very, very muddy roads! 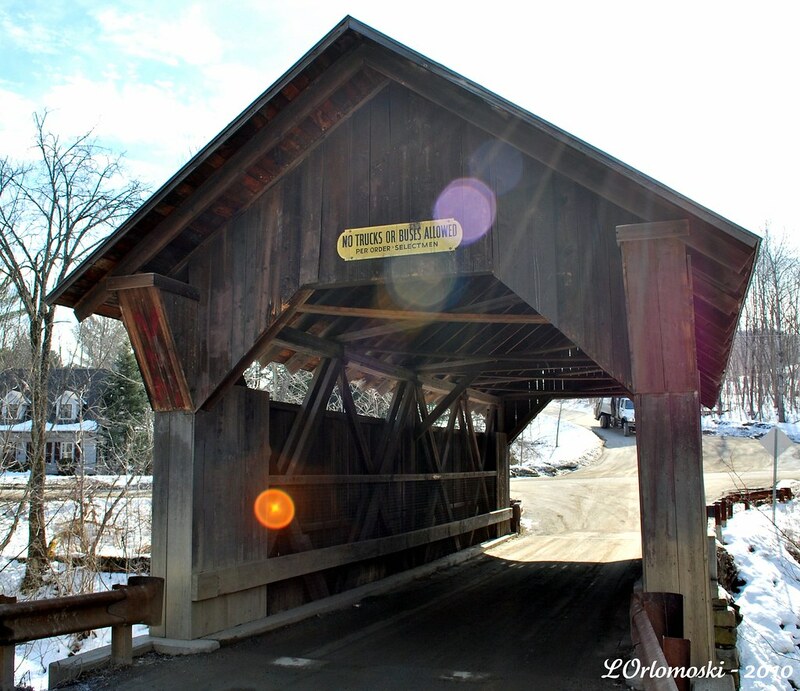 The current bridge is the second one to span Gold Brook with the first being built in 1803. 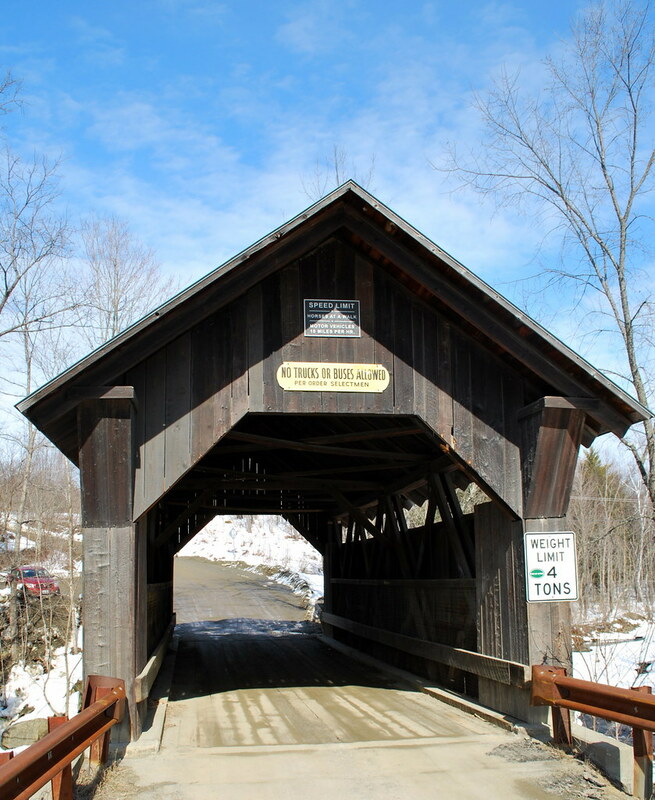 The present bridge was designed and built by John W. Smith in 1844 in the Howe Truss style which uses iron rods and angle blocks making it extremely sturdy. 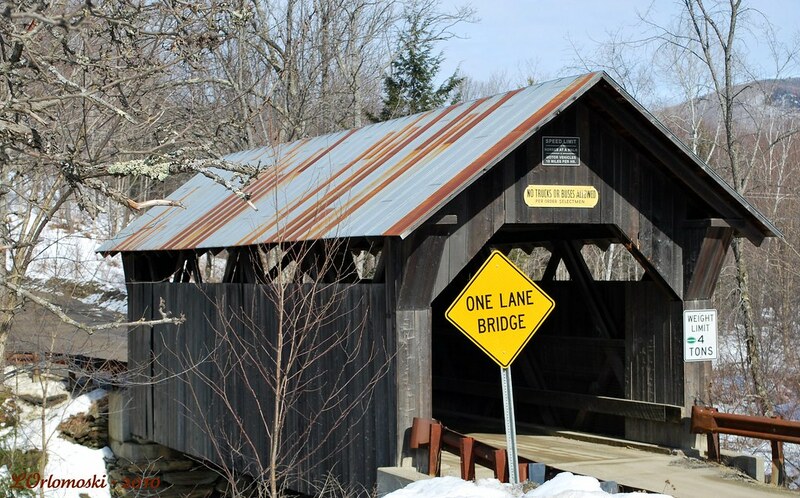 Apparently finding a Howe Truss in a 48-foot highway bridge in the middle of Vermont is something of an anomaly as the design was used for the much more stringent loading requirements of railroad bridges. I guess Mr. Smith wanted to build a bridge that was going to last! Emily's Bridge is in very good shape and will apparently remain so as in 1969 the town signed an agreement for perpetual care of the bridge. There's a bronze plaque in the grassy area near the east portal that declares their resolution but I didn't see it while I was there - under a snow bank perhaps? Now as to the legend of Emily and the haunting of the bridge there are three different versions of the story: First and foremost is that she was forbidden to see the man she loved anymore as her parents felt that he was too poor so she and he made plans to meet at the bridge and run off together. Her parents caught wind of their plans and hired some local thugs to rough up Emily’s intended so that he was unable to make it to the bridge at the appointed time. Emily waited all night long and, when he failed to show up, out of despair she hung herself from the rafters of the bridge. 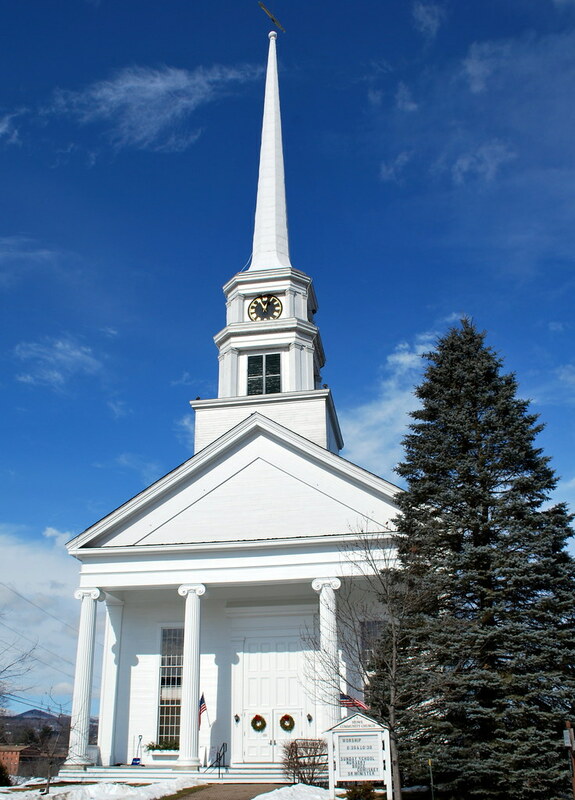 The second version has Emily being left at the altar by her fiancé whereupon she grabbed the family wagon and horses and went galloping off down the road; blinded by hurt and anger she failed to negotiate the turn near the bridge and Emily, the horses, and the wagon all careened over the steep bank and plunged into Gold Brook where Emily and the horses met their demise. Third, homely Emily became pregnant and when her father insisted that she and her boyfriend marry, the boyfriend decided to hang himself on the bridge rather than marry her; after Emily gave birth to still-born twins, she also hung herself from the bridge. The legend is said to have begun in 1849 and since then the bridge has been haunted with what is rumored to be the ghost of a very angry Emily. Some of the events that people have reported include scratches on passing wagons and now cars, a woman’s voice has been heard in the bridge either screaming or crying or asking for help, strange lights have been seen in and around the bridge, ghostly figures have been seen, and some have even reported hearing the sound of something dragging across the roof of their vehicle as they drive across the bridge which they assume to be the sound of Emily’s hanging feet dragging across the top of car. Even knowing all of this beforehand, I didn't feel the least bit creeped out or afraid while I was walking around and through the bridge taking pictures. As much as I would love to tell you that Emily and I connected and had a meaningful Ghost Whisperer "cross over to the light" kinda conversation whereupon I encouraged the ghost of Emily to release her anger and along with it the bonds that hold her to this earthly plane, either Emily was taking the afternoon off or was feeling more benevolent than angry the day I was there as she decided not to show. Heck, I didn't even get a single orb in any of the pictures I took so what kind of haunted bridge is that? it still made for a darned enjoyable day and there were still more bridges to be found even if they weren't of the haunted variety. With tourist map in hand and the GPS programmed with a target destination, I set off down the muddy road to continue my adventure. 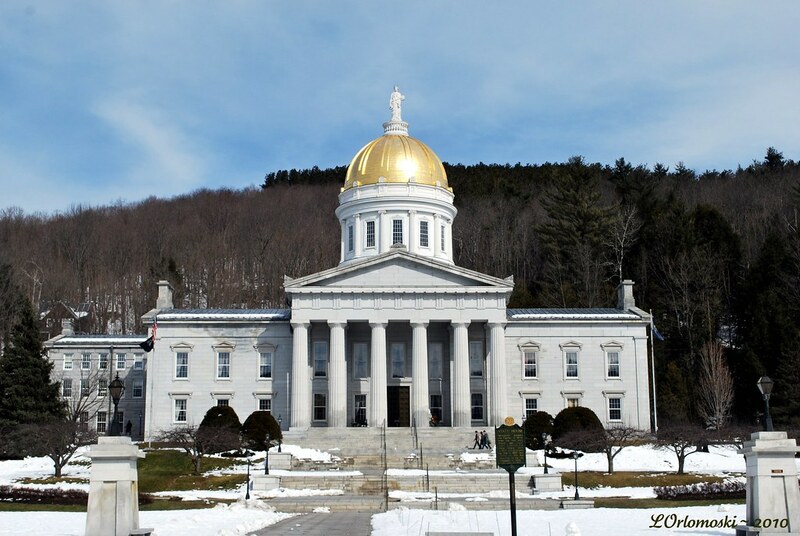 I didn't know that about VT's captial city... the State House is beautiful! Emily, the story goes, lived with her family up on one of the high hill farms which lie to the east of the village. Emily's father had Emily, and a bunch of younger children, but he didn't have a young man to help out with the chores so he hired a boy from the village. Naturally, he and Emily, being quite close in age, became fast friends, and Emily took to walking down to the covered bridge after her morning chores to meet him and the wagon as he came back from delivering the day's milk to the Mansfield Dairy (which is still in operation today). This went on all through the summer, the fall, and even as winter set in and Emily was carrying hot baked potatoes in her pockets to keep her hands warm, and so they'd have a hot snack to share on the ride home, Emily is still walking down to meet the wagon. Well.. one day it starts to blow up and Emily's parents tell her not to go down in the storm to meet the wagon. But Emily insists that if she doesn't go down he'll be worried sick that she's not at the Bridge and stop at every farm on the way home trying to find her.. and he and the horses will be endangered. So she went. She got to the bridge and hunkered down to wait. Sure enough.. on he came through the storm, worried sick and very relieved to find Emily safe on the bridge. But it was so bad the young people decided they best make a night of it right there on the bridge, so they settled down to weather out the storm as best they might. And were dead by dawn. 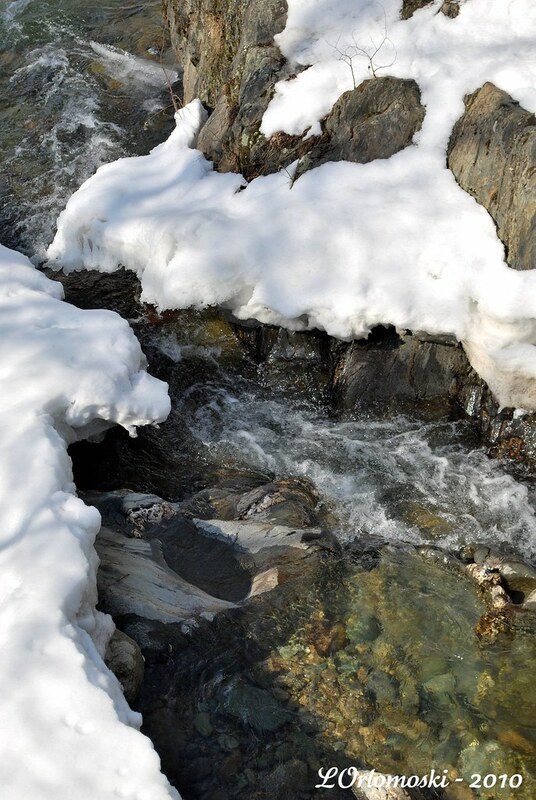 There is a moral to this story: Emily and her young man stayed on an open bridge and died of hypothermia as a result. Had they gotten off the bridge and gone under it, out of the wind, and piled up snow to form a wall, they very likely would have made it through the night. By staying in the open on the bridge the wind sucked the heat right out of them, and by the time they realized they were in serious trouble they'd have been too sleepy or cold to care. Great job once again! Loved the photos and the story. You are a brave girl. Perhaps she thought it would not be any fun if you were not frightened. We used to have a covered bridge near by. It is refered to as "the old covered bridge" however, it caught fire long ago and was replaced with a normal bridge. Bummer, I was looking forward to pictures. The view is breathtaking! I'd love to take a trip there one day. I have friends from Montpelier. I think Amy would enjoy visiting Emily and her bridge. No orbs? What a disappointment Duchess!! That's a beautiful old church and I love the drug store. Such quaintness. 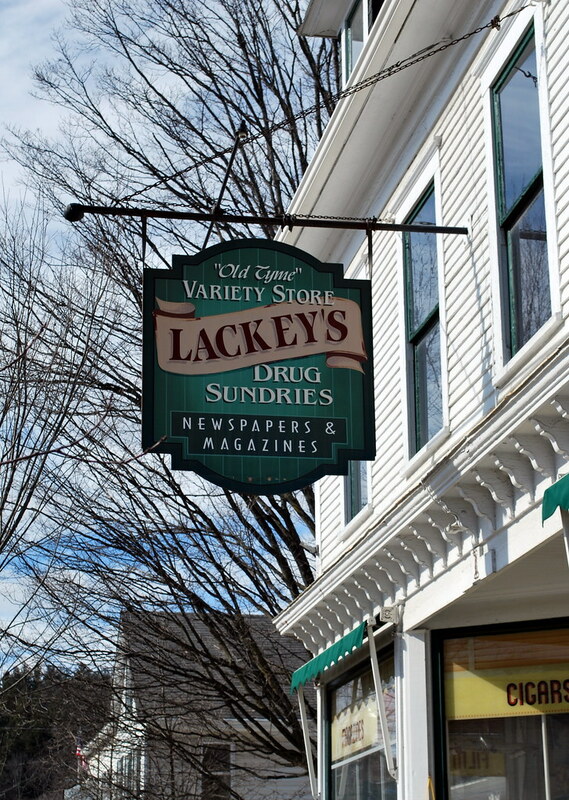 Local legends like this one add so much to the flavor of a place. 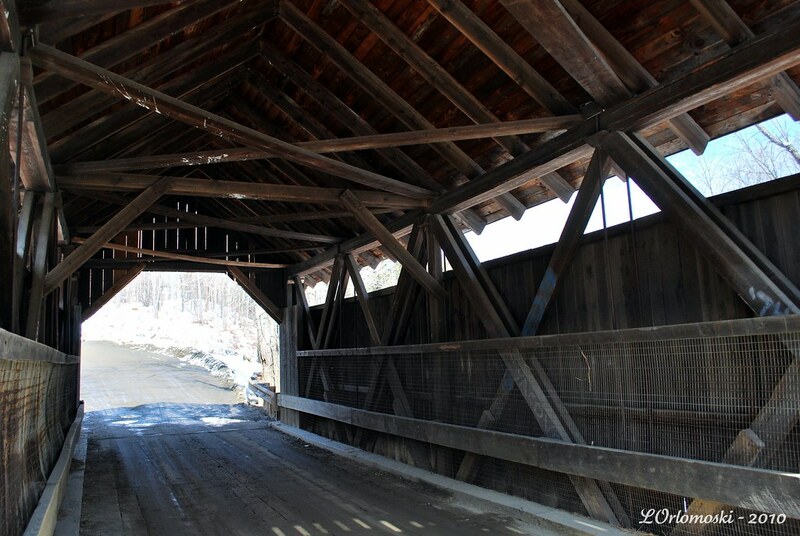 A great day out, a beautiful series of pictures, a covered bridge and the story of if not an encounter with a ghost. Now that is a true "Linda" day. No orbs? Check the second photo of the bridge on this post...I saw a purple orb & an orange one - couldn't miss either of 'em! Anyway, nice shots of the bridge & surrounding area. If you want the best quality, best price, and best service for your photo prints, click the icon! Should You Attend Photography School? Top O' the Day to Ya! Will There Be Justice For Sarah? A Vermont Sneak Peek - Or Is That Peak? 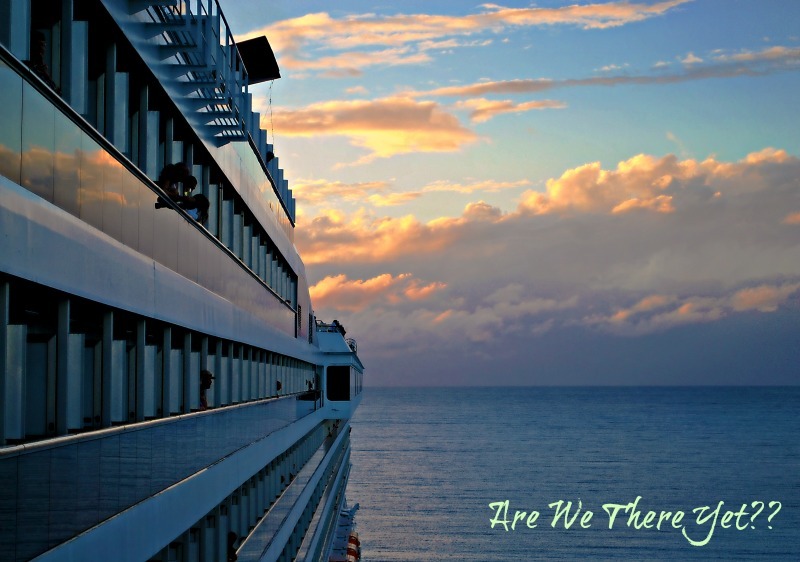 Copyright © 2006/07/08/09/10/11/12 Linda Orlomoski. All Rights Reserved. If you want to use it, ask permission first!